Halloween is here! Although the rainy weather is a bit disappointing, these incredibly creative treats give you a reason to move the party inside and indulge. So gather ’round, tell some scary stories and get creative in the kitchen! Remember, we all prefer treats to tricks, so everyone stay safe and let your sweet tooth go wild for a day or two. 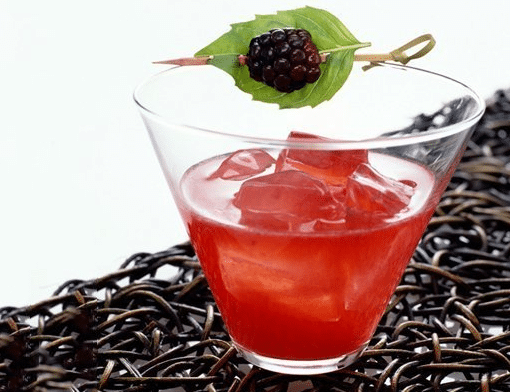 Happy Halloween from Crave Catering! Vanilla cupcakes, green food coloring, a marshmallow and pretzels for the bolts. Don’t forget the icing for his eyes and hair. 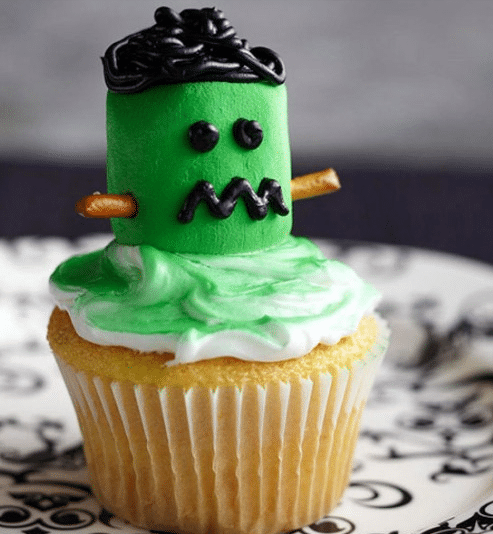 Frankenstein– we’ve created a monster.. cupcake! 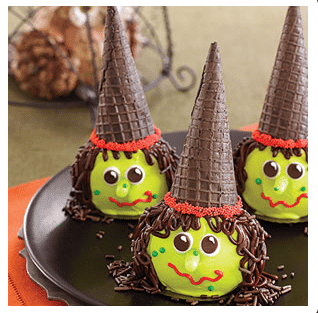 A pinch of chocolate sprinkles, a dash of green food coloring, some chocolate cones and ta da! Your potion for delicious cake ball witches is complete. Check out the recipe here. Take a bite before these healthy treats bite back! 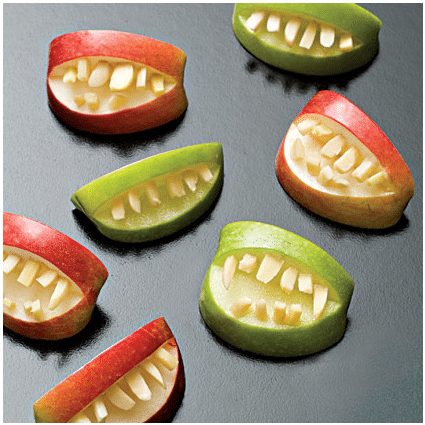 Apple slices cut just right to flash you rows of sharp almond teeth. 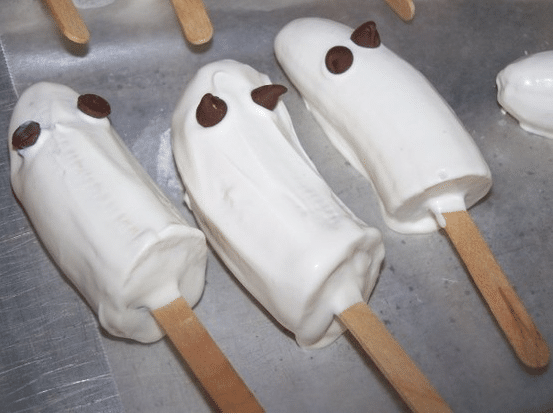 Dip half a banana in white chocolate and use chocolate chips for some ghostly eyes! Wow, how time does fly. We are cruising through this fall season and loving every minute of it. 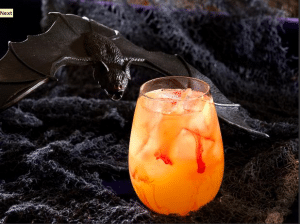 Hallow’s eve is upon us, and we wanted to post some spooky cocktail recipes to get into the Halloween spirit! 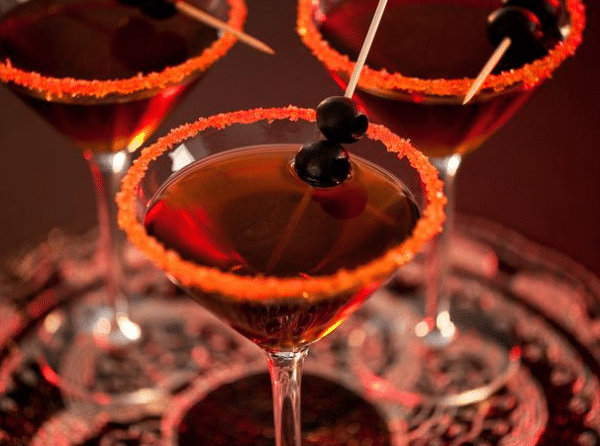 Serve these at your next costume party and have a happy Halloween! 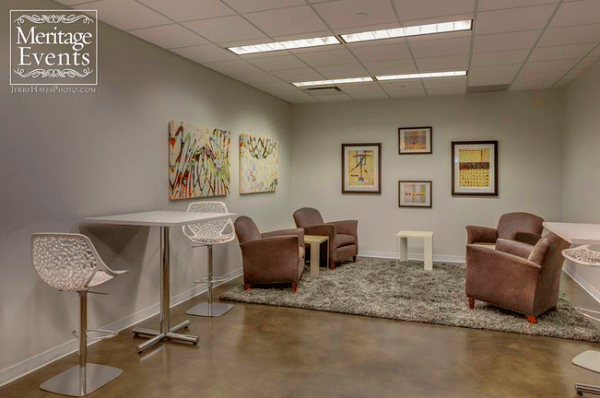 Open House Rescheduled for November 5th! Due to the sudden showers we had last week, the open house hosted at the Umlauf Sculpture Garden & Museum will be rescheduled for November 5th, 2013 from 5-8pm. Come join us for new menu samples that can showcase any wedding or event. 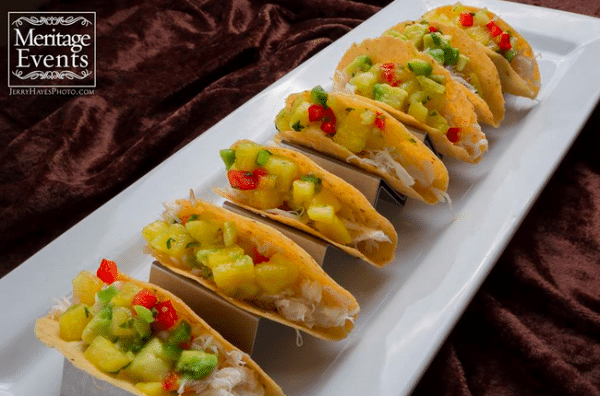 We served these scrumptious lobster and crab tacos at our last corporate event with great success. Topped with goat cheese and our pineapple salsa, the combination couldn’t be more perfect! Here at Crave, we love catering all sorts of events. 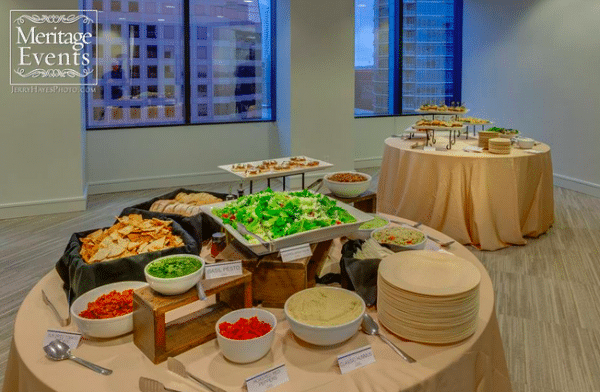 From weddings to birthdays or corporate events, we create menus that incorporate all of the elements of your vision and bring our A-game to the table. 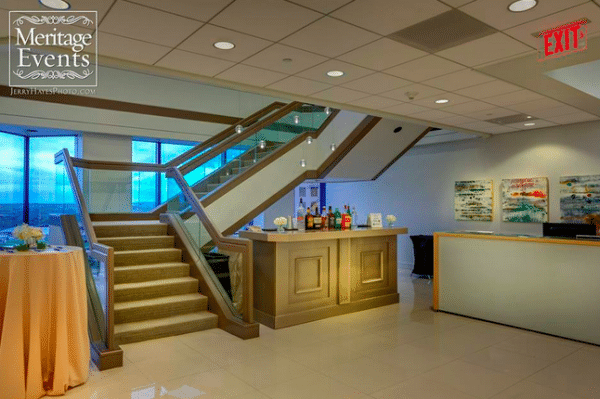 We just finished up a corporate event alongside some wonderful industry professionals. Cheers to Meritage Events, Townsley Designs and David Kurio Designs for another great night! 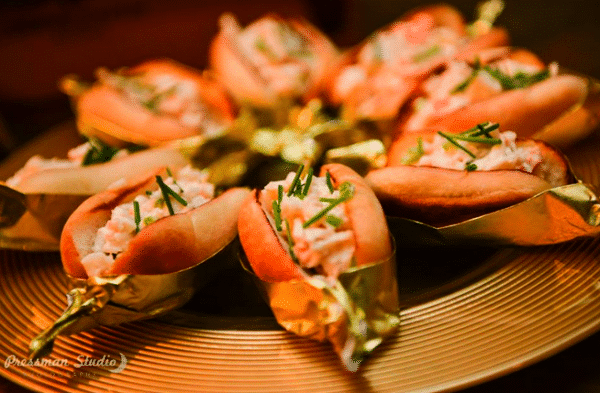 Check out some of the brilliant photographs of the event designs, florals and food shot by Jerry Hayes Photography. 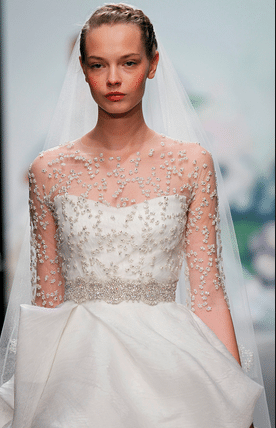 This season brings a new array of trends for all those fall weddings! 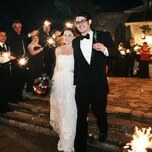 Compiled from some of the go-to wedding blogs and sites online, here are some hot new ideas to incorporate this fall. Gold, silver and bronze have made a comeback. Not that they ever went away completely, but this fall has been especially keen on everything metallic. 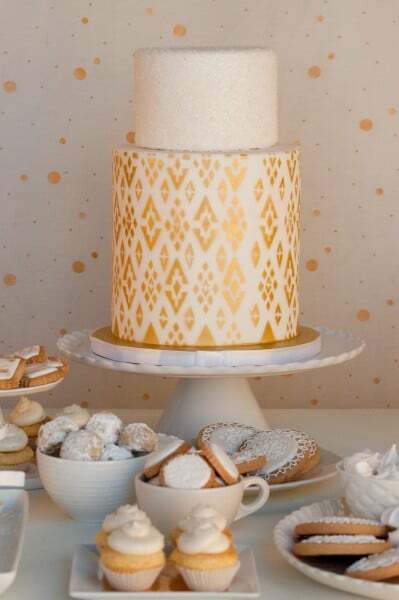 Tableware, glass ware, linens and even the cakes themselves! 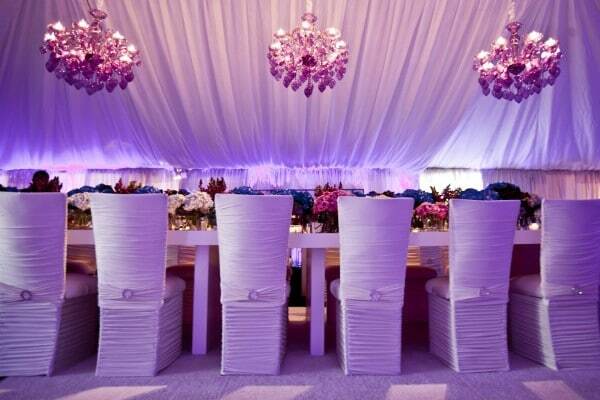 A touch of metallic can add a luxurious look to any wedding. The Great Gatsby-esque look and excitement has brought this trend back with shimmering excellence. 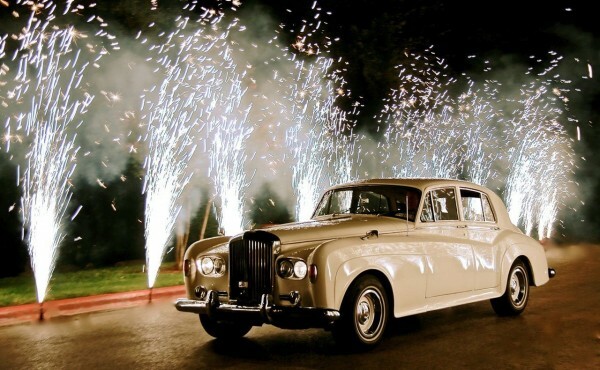 Rather than the vintage trend from last year, the ante has been upped with more luxurious wedding receptions being seen this fall. The dress style this season will add coverage but maintain elegance with sleeves and coverlets. Trending after Kate Middleton, soft capped sleeves perhaps adorned with lace or beading have become all the rage. 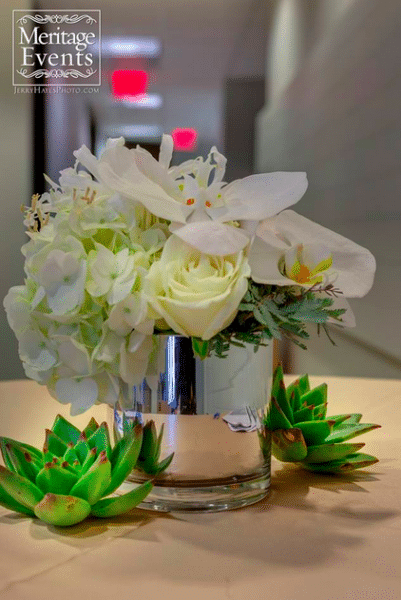 Blooming bouquets full of strong colors are the new trend this season. While Peonies are most definitely in, fuchsia and lovely orange accents make a bold but beautiful statement. Now, I know we all can’t help it sometimes; the allure of getting as many likes as possible on Facebook and Instagram are hard to resist. Today we wanted to talk a little about the brilliant trend for weddings this year that is all too alluring to wedding professionals (mostly wedding photographers) as well as the bride and groom. We all know a photo-bomb when we see one, but this kind of photo-bomb is not always intentional. Unlike your nephew “Timmy” with his tongue sticking out so far he could almost lick his nose just for the sake of being funny, these are normally obstructed or missed opportunities for the perfect shot to be captured. Wedding photographers are paid a lot of money to capture these whirlwind and magical moments that occur during this wonderful celebration of love between two people: the ceremony, the vows, the first kiss, the first dance… but how often are these pictures squandered from their maximum potential by the guest jumping in the aisle to snap a quick shot with his iPhone? Far too many unfortunately. If an entire unplugged wedding is too far fetched to ask your guests to endure, compromise by having an unplugged ceremony. No one will regret it when those memories are brilliantly captured. So think about it for the day you tie the knot, we at Crave Catering sure do approve of the Unplugged wedding trend! In the midst of the government shutdown, the struggles in Congress have caused various problems outside of Washington. Nearly 24 couples in D.C. are furious that the shutdown has put a damper on their October weddings. More specifically, for engaged couple Mike Cassesso and MaiLien Le, their dream of tying the knot at the Jefferson memorial was thwarted by the closing of all U.S. National Park facilities. This is where Stephen Colbert stepped in. Having promised he would take over any cancelled government services, he decided to host the wedding of a lifetime for them. Oh, Colbert you funny, funny man. Complete with bridesmaids, the groomsmen and a beautiful ceremony on set, even Smoky the Bear was in attendance (He didn’t have to go into work anyway). The backdrop displayed the Jefferson Memorial to keep Mike and MaiLien’s dream alive, and pre-vow shots were provided for all. We’d like to think that if he had picked a caterer for the reception, it would have been us. Click on the link to check out the wedding of the century below! Planning an event where food is involved is quickly becoming a difficult task. 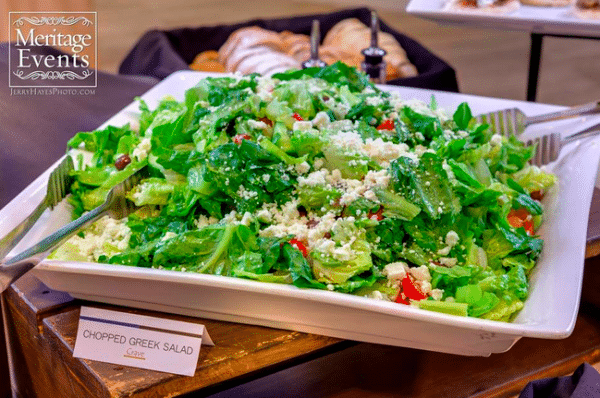 Food allergies, dietary restrictions and personal dietary lifestyles have made for slim pickings if you choose to accommodate to every guests’ needs. How do you offer healthy alternatives to people with high blood pressure, diabetes or celiac disease, or people who don’t eat meat like vegetarians and vegans? What about people with food allergies? A lot of these terms may not be familiar to everyone, so we want to explain what it means when people say they are gluten-free or vegan to avoid confusion. Dietary vegans (or strict vegetarians) who refrain from consuming animal products or byproducts including eggs, dairy products and other animal-derived substances. Vegetarians don’t eat any sort of animal flesh. This includes beef, poultry, game, fish and seafood. Any meat by-products, such as broth, gravy, fat, or foods cooked with meat are not acceptable either. Diet consists of leafy greens, vegetables, fruits, seeds, nuts and grains and on occasion eggs and dairy products. This diet excludes all products that contain gluten. Gluten is a protein complex found in wheat including kamut and spelt, barely and rye. A gluten-free diet is the only medically accepted treatment for celiac disease. Using quinoa, grains, and rice varieties can appeal to many of these diets. The use of gluten free flour is also a simple way to exclude gluten from desserts. Pasta stations where guests can pick their own ingredients is a great way to incorporate these diets into any event (be sure to include a gluten free pasta.) In order to avoid any conflicts at events or weddings, Crave likes to use proper tags on all of our dishes. With prior notice, we are also able to list individual ingredients and are happy to work around any restrictions or allergies your guests might have. Our chefs have the knowledge and culinary skills to appeal to any diet and customize it to your needs, so lets discuss menu plans! Give us a call or request our set menu to get an idea of some dishes that may work for your next event here. Make sure to check out the U.S. Department of Agriculture database on the nutrient values of ingredients as another great resource to use when in doubt! Download the data base for free on their website here.